Justine Siegal will join the Oakland A's as a two-week guest instructor. 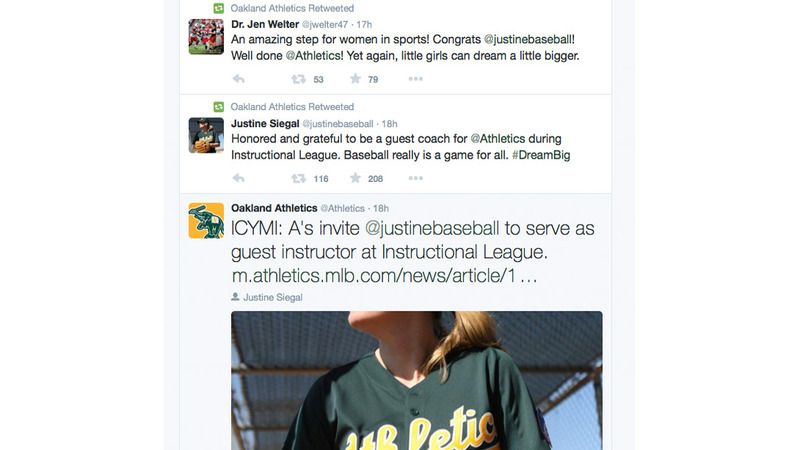 The Oakland Athletics announced on Tuesday that they hired the first female coach in the MLB, Justine Siegal. The 40-year-old has been hired as a two-week guest instructor for the A's International League Club to help player development staff both on and off the field. Siegal has completed MLB's scout school, held batting practice for six teams, which included the A's in 2011. The A's general manager, Billy Beane was the first GM to sign her for batting practice sessions. According to insidebayarea.com, Siegal has maintained a relationship with Beane, letting him know that she would like to break out into the pro-baseball world. She is ecstatic about the opportunity, and is quoted in the article, saying, "I'm going to focus on being the best coach I can for those two weeks." Siegal will work with the Oakland A's until October 17. The A's assistant manager, David Forst, says Siegal is "more than qualified, no matter what gender." In the release, he goes on to say Siegal "brings with her a wealth of knowledge and expertise from years of playing, coaching, and teaching the game, and all of our young players stand to benefit greatly from her time in camp." In 2009, Siegal was the first female coach for a men's minor league team, coaching the Brockton Rox, an independent team. As of right now, she heads Baseball For All, a national nonprofit organization that promotes girls in baseball. Siegal also holds a PhD. in sport and exercise psychology from Springfield College in Massachusetts. While at Springfield, she was an assistant baseball coach from 2008-2010. Siegal would love to coach full-time, but this is a great starting point! She is making history along with other female coaches, like Becky Hammon who was a full-time assistant coach for the NBA's San Antonio Spurs, and Jen Welter, who was an assistant coaching intern for the NFL's Arizona Cardinals.